I almost threw up when I read this article in the news today. Urgghhh….. 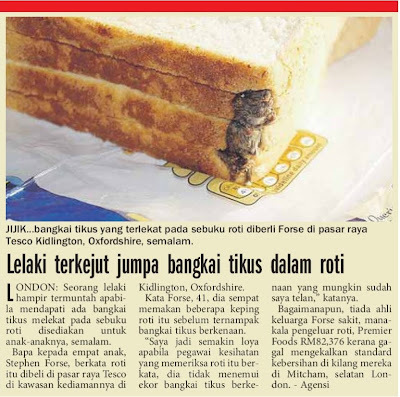 Translation: Man shocked to find dead rat in bread. London: A man almost threw up when he discovered a dead rat stuck in a loaf of bread he had prepared for his children, yesterday. Father of four, Stephen Forse, said that he had bought the loaf of bread at a nearby Tes.co store in Kidlington, Oxfordshire. Said Forse, 41, he had already eaten a few slices of the bread when he noticed the dead rat. Eventhough none of the Forse family members got sick, the bread manufacturer, Premier Foods, forked out RM82,376 for failing to comply with cleanliness standards at their factory in Mitcham, south of London. First of all, a dead rat in your food?! A dead rat is gross enough, but to find it in your food? Urrgghhh…just gives me the shimmies. And he bought the loaf of bread at Tes.co. I can just picture Noresh going, “There, I told you guys. Don’t shop there!” Heeeee. Personally I think the amount forked out by the bread company (it didn’t say as compensation to family or not) is waayyy to little. The dude is traumatized for life at the sight of bread! He had a dead rat in his mouth! Urghhhh…excuse me while I go rinse out my mouth. Macam aku lak yang tergigit bangkai tikus ni. Uwaaa. OK, enough about the cat lover. Here's random facts about what's going on at Casa Along. 1. Dania is having her exams this week and she only told me yesterday. She called me up at work for me to wish her luck. 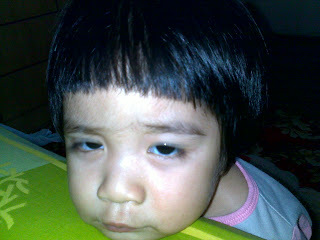 Her exact words were "Ibu, wish me luck. I have exams today but don't worry, I already read my books last night....when you were at school." Note, the last part of her sentence got me. 2. Dina is going to be 6 next week. My brother is going to have a makan2 session on Sunday (which my MOM told me about..and invited me to. Tuan rumah tak ajak pun...but who cares..:P) so I may crash the party with a birthday cake for her. 3. I got really good marks for my Econs paper!! Yeah!! I was a bit peeved that I lost marks for not understanding correctly the question but all in all, over 20, 18.7 is not bad. Not bad at all!! I just hope I can continue to pull in good marks for this class. My group presentation is due next Monday (to which the cat lover is also in my group) so this weekend will be used to complete that and the many other assignments pending. 4. 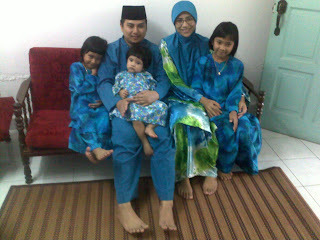 Hubby and the girls may be going back to Melaka Friay night for hubby's cousin's wedding. Which means I'll be home alone again this weekend. But only until Saturday night since the makan2 session is on Sunday. 5. I may use the time alone to go visit my dear friend Noresh, who gave birth to a new baby boy 3 weeks back. I still have her Spanx she ordered. Heee...jangan marah ah Noresh. Anything, I'll call you. 6. I can't believe my 1st trimester is almost over. Only 2-3 more classes, then the Finals. Wow. 7. I'm on my 5th day of puasa enam. Hopefully I can complete before Syawal ends. 8. I need to wax my legs. Like seriously. OK, here’s more info on the cat lover. Korang ni..aku posa tau..tapi dek dah bukak cite, habis semua aku nak citekan kat sini. Muahahahaha..
Today, we tried to include him further in the assignment discussion by giving him some research to do. Ok, one thing, he acknowledges the fact that he has not contributed anything. I'll give him that. However, his reason was “I can’t help it”. Against his religion? Teachings while growing up? Personal values? Again, I find myself at a lost reading his email. Muahahahaha…brought up by the cat like Mowgli and Baloo? Like Tarzan and the apes? The image is running through my head. How can a situation be so seriously funny and irritating at the same time? I’m a cat lover myself but at a loss for words when one of my coursemates gave an excuse he couldn’t complete his portion of our group assignment because HIS CAT IS MISSING! When I saw his email, I almost choked on my own saliva! I exchanged sms’s with another coursemate, all the while laughing about the situation. Heinous, I know. But come on…the cat’s probably out getting lucky somewhere, with some bad boy tom cat from the neighborhood. If there’s one thing I’ve learned during my 1st trimester, is that I really need to select better group mates to do group assignments with. I don’t claim I know everything but if I’m willing to sleep at 3am, googling up information, then I expect my groups mates to at least add some value to the assignment. It’s one thing to get a good mark but to get a good mark when you haven’t contributed anything of value to the group assignment, just bugs me. I know I should say something to the lecturer, tapi tak sampai hati pulak. If I tell, it’s not going to affect my grades in any way, so…hmm..just let it be la. What would you guys do if you were in my situation? Tell the prof? Let it be? This weekend is full of invitations to weddings, open houses and birthday parties. Which is great because I don't have to rack my brain thinking up what to cook for the family. Heee. Today we had 3 invites. The 1st one was to our neighbour's daughter's wedding. It was held at one of the Uni nearby. The food was great but since we had 2 more invites to attend to, I didn't eat much. The family sharing our table was also from our Company, so we had a lively discussion talking about work and what-not. We got to see the bride and groom as they walked into the hall; they looked exquisite. Next, was off to my colleague's house for her son's birthday party. The girls had fun, playing with the other kids there. Even Daria made new friends. And ate so much fruit cocktail. Then it was off to hubby's aunt's house. The invite said to come at 2pm but because of our other commitments plus it was raining heavily, we arrived around 5pm. Heeee, janji makanan still ada lagi. Satay!! Which even the kids ate a lot of, surprising since it was the 3rd house we "attacked" for food. We reached home around 830pm and everyone was tired and way to full to do anything else, except bathe and go to sleep. Unfortunately I have several assignments due next week, thus the reason why I'm still up. I feel like having a garage sale. Everytime I enter the 2nd bedroom upstairs, I see all the accumulated clothes, books, toys and basically junk stashed up in the corner. It's a hassle to sweep there plus I'm almost certain something could have died there without me knowing. I know I have too many books to count, plus the girls have many clothes that are too small for them but still in really good shape. And God knows, hubby has too many shirts and t-shirts to fit into his closet. I wonder if I can rope in my mom and brothers to join in for the garage sale. Yes, this is going to be my next project. Like I haven't got enough projects already. Semalam aku dapat results mid term Accounts. Surprisingly, markah aku untuk accounts lagi best dari markah aku untuk kelas OB. Ke4 terbaik!! Hmmm…ini either aku memang terror ataupun prof accounts tu main taram je mark paper. Lepas tu suka sedekah markah kesian. Ni bukan komen aku je, bebudak lain dalam kelas accounts pun terperanjat tengok markah masing2. Macam ada harapan nak dapat A. Muahahaha..cite2 besar nampak, Long. Ko takyah repeat dah bagus! Markah Econ blum sure lagi...minggu depan kot baru dapat. Anyway, semalam aku kena pi standby kat product training satu hari. Standby, dalam erti kata lain, aku dok kat belakang surfing internet manjang. Training tu habis kul 515pm, so aku pun terus cabut pi Uni lepas tu. Time tu blum solat Asar lagi, so aku terus pi surau. As usual, surau tu selalu jadi tempat melepak bebudak undergraduate kat situ. Aku pun tak paham la, banyak lagi tempat ko bleh lepak diskus hal boyfriend ke, hal sekolah ke, hal jerawat ko yang tumbuh macam cendawan tu…yang ko pilih berkampung dalam surau apahal. Dah la surau tu macam gua sket, cakap sket dah bergema semacam bunyinya. Time aku nak solat tu, tak ramai sangat la orang tapi. Ada la a few tengah solat. Plus satu group adik2 undergraduate ni, dalam 5-6 orang berkampung kat depan. Lagi satu…ko nak berkampung tu, bleh tak berkampung kat belakang surau. Ni orang nak solat ni, ngadap ko lak yang terbaring2 kat depan tu. Siap ngan makanan2 sekali. Suara berdiskusi tu jangan cakap la…macam kawan tu dok kampong sebelah. Lepas aku dah ambik wuduk, aku lalu kat sebelah group adik2 tu. Aku rasa aku sound dah elok dah, “Dik, cakap slow sket, orang nak solat ni.” Aku rasa aku senyum sambil cakap tu…nada suara lembut. Tapiiiii…apesal aku tengok muka adik2 tu masing2 masam macam aku pi sound pepek depa busuk bau belacan?!! Serious…aku pun macam heran je tengok reaksi adik2 tu. Tapi lantak la, janji depa senyap time aku nak solat. Tapi kejap je la senyap…time aku langkah keluar surau, macam nak start balik riuhnya. Hai, ntah la…takde sense of respect langsung la bebudak muda sekarang ni. Puasa Enam + Puasa Qada = Tidak Elok? Hari ni aku start puasa enam. Ni tengah sahur la ni...roti 2 keping, ngan milo panas secawan. Cukup ke? Hehehehe..puasa bulan lain tak sama ngan puasa Ramadhan. Time Ramadhan, dek semua orag puasa, kita tak terasa pun lapar ke dahaga. Time bulan lain, orang lain sebut roti krim pun bleh terliur. Pandang iklan makanan dalam suratkhabar pun dah satu dugaan besar. Hehehee...insya'allah...moga berjaya puasa enam aku tahun ni. 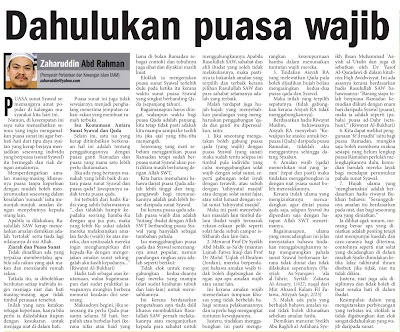 Aritu aku ada terbaca artikel pasal hukum menggabungkan puasa enam ngan puasa qada'. Kebetulan tahun ni memang aku kena qada' 6 hari puasa, so memang memula niat tu nak sekalikan puasa enam syawal ngan qada'. But then, lepas baca artikel ni...hmmm...maybe tak jadi gabungkan kot. Dalam artikel ni, dia ada sebut sebab2 kenapa tak elok gabungkan puasa enam ngan puasa qada'. 1. Sebab puasa qada' tu wajib while puasa enam tu sunat. Maka, tak elok la kita gabungkan ibadat yang wajib dengan yang sunat, especially kalau kita mampu untuk berpuasa dari segi kesihatan dan sebagainya. Kalau puasa kita bleh gabungkan yang wajib and sunat, tidak mustahil ada individu yang bagi alasan untuk menggabungkan solat wajib ngan solat sunat. Yang kita tau, memang takleh la. 2. Aisyah RA pun ada menyebut "kewajiban ke atasku untuk berpuasa qada' daripada puasa Ramadhan, tidaklah aku menggantinya sehingga sampai Syaaban." Meaning time bulan Syawal, Aisyah berpuasa dengan niat berpuasa sunat enam sahaja, tidak digabungkan ngan puasa qada'. Dah masuk bulan Syaaban, baru la start puasa qada'. Kalau Aisyah RA buat macam tu, rasanya itu la cara yang lebih afdhal, bukan? 3. Amalan wajib (qada') memerlukan niat yang "jazam" (tepat dan pasti). Kalau kita niat dengan menggabungkan puasa sunat, boleh merosakkan niat yang wajib itu. 4. Tiada dalil khusus yang menyebut Rasulullah SAW atau sahabat/keluarga Baginda melakukan gabungan puasa wajib dan sunat. Kalau Rasulullah tak melakukannya atau menyeru untuk melakukannya, maybe sebab ia bukan cara yang terbaik. 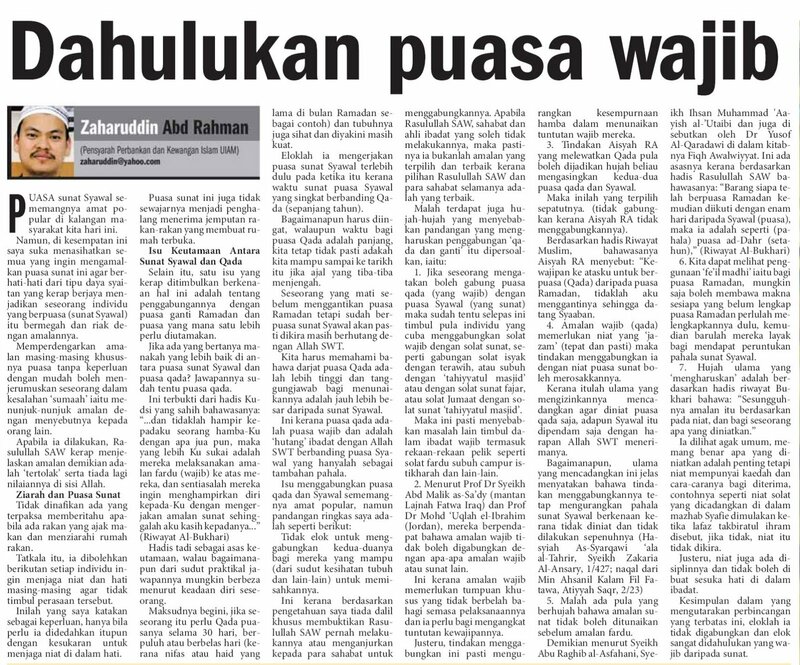 Ada banyak lagi la hujah2 dalam artikel ni kenapa puasa enam tidak patut digabungkan dengan puasa qada'. For me, yang tahun2 lepas tu, aku anggap sebab niat asalnya untuk puasa qada', kalau Allah terima niat puasa enam tu sekali, alhamdulillah. Kalau tidak, semoga diterima niat dan amalan puasa qada' tu je la. Tahun ni, insya'allah, aku buat dulu puasa enam....then dah selesai, baru start puasa qada' pulak. Kalau buat Isnin Khamis, Isnin Khamis, kejap je selesai ganti....ye tak? ...back at work after the long raya break. Eventhough it was heaven, getting up at 11am (earliest! ), playing with the girls, cooking for the family..coming back to work was also strangely welcoming. Speaking of weekends, seeing how it's still early Syawal, we have open houses and weddings lined up every weekend. I might be able to go to the ones close by but may have to pass on those further away. This month and the next is going to be extra busy. The launch project for our product is due on the first of next month while the commercialization is due in October. My accounts group project is due end of this month(eeeeekkkkk!!!) since the professor is going off somewhere starting next month. Suka2 je ditch kitaorang tengah2 semester camni. Hmmm. Good thing I've started on my Economics group presentation but have yet to do anything for my OB group presentation. Yikes!! My armpits are sweating already with anxiety. Raya was tiring but fun. 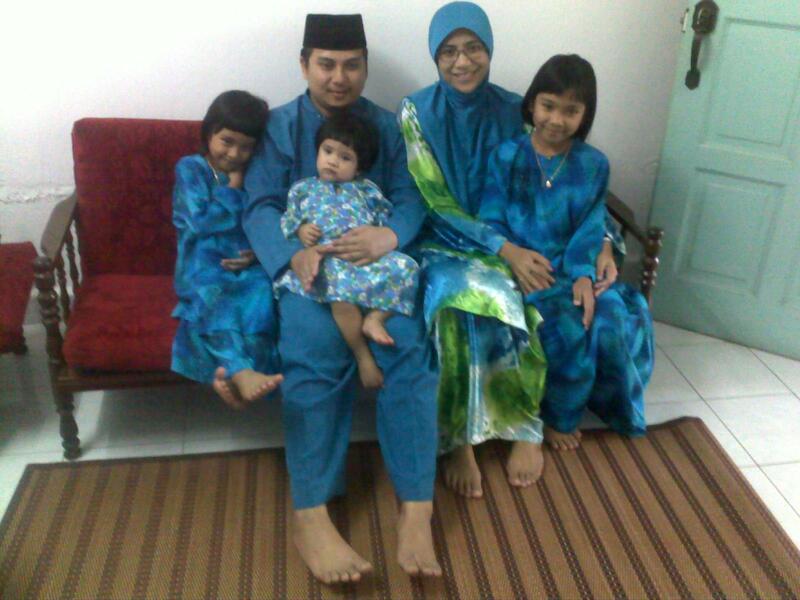 Here's us on the first day of Raya at my in-laws. 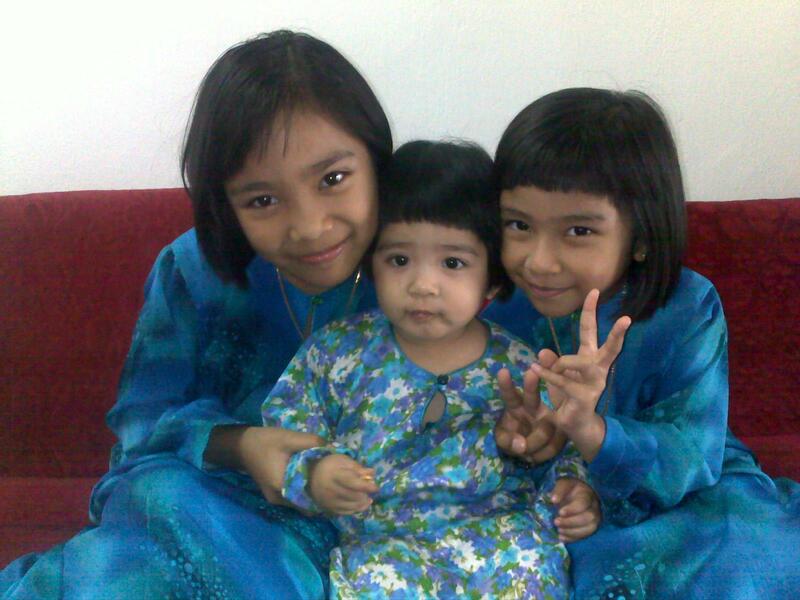 Here are the girls in the baju kurungs my MIL made for them. How cute is Daria?! We had arrived at my in laws a day before raya. I had time to buy new shoes..hehehehe. My MIL cooked up a storm; both chicken and beef rendang, plus 60 ketupats. On the 1st day, we all headed to my MIL's sister's house where everyone was there. The girls had great fun playing with their cousins. And got lots of duit raya. After Friday prayers, we headed back to Muar to visit my FIL's brother. We stayed for dinner (where I stuffed myself with more rendang). We then went to my MIL's older brother's house and stayed until midnight. Surprisingly Daria was still energetic and she didn't fuss eventhough it was waaaayyyy past her bedtime. On the 2nd day, we went to my MIL's sister's house in Ayer Keroh. We had lunch (more rendang!!) then headed back to my parent's house. Only my dad and my brothers (minus my married brother) were there. My mom had gone out shopping with her sister. Cet! We stayed until after Maghrib then headed back home. I had tons of laundry to do!! The next day, we went to Keramat to visit my grandparents. My cousins from Melaka were there so the girls had fun. My mom and brothers came down also. There was so much food, I couldn't stop stuffing myself. We stayed until 8pm then headed back home. On the 4th day of raya, we headed back to my dad's hometown. We 1st went to Batu Pahat (Hi Jojet!) to pick up my aunt and uncle, then to Yong Peng and then Segamat. By the time we arrived at Cha'ah (our sleeping port for 2 nights), we were all lemau!! Hehehe.. The next day, we went back to Kratong to visit my uncle. I love going there because my aunt would always cook exotic animals for us like ayam hutan (exotic kah? ), porcupine or deer. This year was kind of a let down (only chicken....and more beef)...but they also had lala...so nice!! Dania loves lala so she ate plenty. Yesterday was time for us to head back to KL before the traffic jam starts. We stopped by at my in-laws for lunch then I hitched a ride with my brothers back home. Hubby and the kids are staying there until tomorrow. Like I said, raya was fun but tiring. I'm so tired....but happy. Happy Raya everyone!! 9 years ago, we started our journey together. 9 years ago, we learned to think and act as a team. 9 years ago, we told each other our dreams and promised to help each other achieve them. 9 years ago, we told each other our fears and promised to always be together through thick and thin. 9 years ago, we promised to love each other, no matter how much we drove each other crazy. And today, we are still on that journey. It’s been an adventure so far. 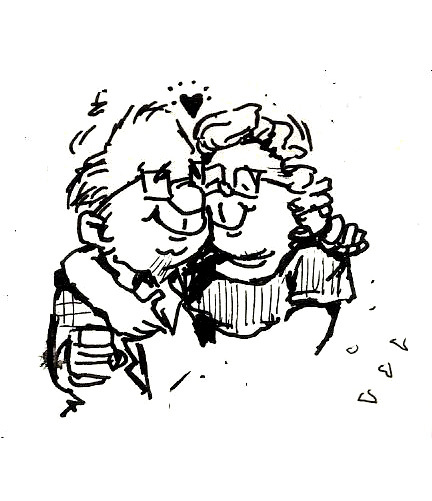 Today, we are each other’s best partner in crime…and passion. Today, we achieved those dreams…and so much more. Today, we conquered those fears and realized how strong we make each other feel. Today, the love we felt has deepened and grown, especially with the addition of our 3 beautiful daughters. Happy Anniversary, Sayang. Thank you for sharing your life with me and for allowing me to share mine with you. Thank you for all the sweet memories. Thank you for being there during the not so sweet ones. I love you so much, words cannot express it. So my mid terms are finally over!! My Econs paper was tonight. Truth be told, I think I aced it. Seriously. For once, I was singing along to all the raya songs on my way back. I was that happy. I can only hope I didn't do any silly mistakes, especially in doing the calculations. I checked, double and triple check all the answers. I wrote feverishly until my arm felt like falling off. The only way I can lose marks is if the prof takes away points for putting in too much information in my answers. Well, hubby is officially on raya leave starting tomorrow. I still have 2 more days of work, then we're all on forced leave until the 20th. The kids have school holidays until the 20th too. So far we haven't made any definite plans to go anywhere except the compulsory places to visit during raya. I have a sudden itch to go to Hard Rock Penang. Our anniversary (9 years and counting!!) is in 3 days, plus with all the hard work I've been putting in at work and school, I just feel like taking a really nice, relaxing trip with the kids. Who am I kidding? A trip with the kids will be anything BUT relaxing...haha! I have my final mid term paper tomorrow. Actually today since it's already past 1am. I'm freaking out because I just started studying. All my plans to study during the weekends went kaput. On Saturday, we spent the day at my grandma's house. My cousins from Melaka came up so it was a joyous event. My mom told us to each bring a dish. Initially I wanted to go all out and cook nasi impit with lontong and peanut sauce. In the end, I cooked fried mee..:P. Which was ok because there was too much food in the end, anyway. We had murtabak, lasagna (my SIL's cooking), something like 6-7 types of lauk pauk...fruits...food galore! We stayed at my grandma's house until midnight then headed to my mom's house. Her maid was scheduled to leave for Indon the next morning for 2 weeks, so I offered to cook dinner for breaking fast. I cooked my speciality, chicken rice. My brothers were very appreciative...hehehe...they finished up all the rice and chicken. We headed back home around 9.30pm. It took me 40 minutes to put Daria down for her bedtime as she was still hyper from all the action that happened this weekend. I have 3 chapters to read for the mid term and have finished 2. Well, finished is not the correct word..I've read through the notes and redone the assignments. According to the professor, his questions will be similar to the assignments so I'm crossing my fingers I will at least know what to write later on. Getting kind of sleepy. Maybe I should get some shut eye. Luckily I'm taking study leave tomorrow so I still have time to do some last minute studying. I'm freaking out over my Accounts mid term tonight. I have to leave in 30 minutes and break fast at the Uni since the exams start at 8pm. En Rashid has a breaking fast session with his vendors so the girls will have to keep each other company during breaking fast. I cooked a simple meal (read: everything fried). Since it's only the girls and Wati (my maid), we recycled some dishes from yesterday and I added some mushrooms as vegetables. I've been reading accounts since morning and the only thing I can remember is REVALUATION. What it is, how to calculate, where to apply, I have no idea. Thank god the mid term is only 20% of our final grade. I think. Anyhow, wish me luck. I'll be needing it, that's for sure.